The Iron Maiden powerhouse reflects on three decades with the band as he wraps up his UK clinics and tells us why he'll never stop. We also have a close up look at Nicko's huge Premier kit and Metallica's Lars Ulrich tells us why he's such a huge Nicko fan. We kick off our new guide to restoring vintage gear with a step-by-step look at how to care for well-loved kits from yesteryear. We pay our respect to master teacher Freddie Gruber who passed away last month. Freddie could count the likes of Neil Peart, Steve Smith, Dave Weckl and Gregg Bissonette among his students. Glen Sobel fills is in on backing Alice Cooper. The session ace talks paying your dues, getting gigs and much more. This month's Rhythm disc teaches you how to play Elvis' rock 'n' roll classic 'Suspicious Minds', ZZ Top's southern rocker 'La Grange' and 'Been Caught Stealing' by Jane's Addiction. We also have the latest guest lessons from Richard Bailey and Lisa Tring plus much more. 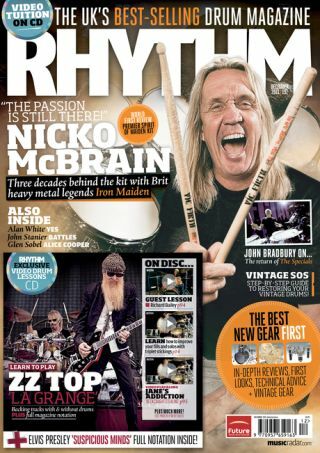 December's issue of Rhythm is on sale now. For a full issue preview head here. To order a copy visit www.myfavouritemagazines.co.uk or Apple Newsstand.